Kingston. The restored Cooke brothers woolstore when Port Caroline was first declared a port in 1865. Lacepede Bay was named by Nicholas Baudin on his 1802 voyage. The first exploration of this area was by Governor Grey and friends who went along the Coorong in 1844 to check out the country. It took them two weeks to get to what is now Kingston. The party went on to Mt Burr, Mt Gambier and ended up at Rivoli Bay from where they took a government ship back to Adelaide. The first settlers in the district were the Cooke brothers Archibald and James who squatted on the Maria Run in 1845 as the best land near Naracoorte and Penola was already being squatted by then. Other early pastoralists near Maria Creek were the Kendles, James Brown, Andrew Dunn, and the Morris brothers and almost all were Scottish. The Cooke property was on Maria Creek which ran into the Coorong draining much of the South East. They already had runs around Wellington and along the lower Murray- hence the township Cooke Plains near Tailem Bend. The area had been named earlier and was already famous by then for the Maria Massacres of 1840. The Maria left Adelaide bound for Hobart in June 1840. About the 28th June it was wrecked off the coast near Lacepede Bay but the crew and passengers managed to get to shore and the local Aborginal people were helping them with food and water as they tried to get help from Adelaide. Whilst waiting for help the sailors began trying to take advantage of the local Aboriginal women. As a form of reprisal 25 of the 26 survivors were killed. It was a month after these events before news of the wreck reached Adelaide and a police investigation was made. Two Ngarrindgeri men were hung and 65 taken as prisoners. Kingston was surveyed as a private town in 1858 on property owned by Sir George Kingston (his son Charles Cameron Kingston became Premier of SA 1893-99) the first Surveyor General of SA and the designer of parts of Government House, the Old Adelaide Jail, and the house called Cummins at Novar Gardens. Recent historical work now argues that Kingston was the designer of the city plan of Adelaide not Colonel William Light and that Light only rubber stamped the location for the city selected by Kingston! The historical evidence is compelling and convincing. The first land surveyed in the district was put up for sale in 1855. Kingston bought 2 sections of land, and the Cooke brothers bought 10 sections to complement their leasehold run. Governor MacDonnell named the town after his Surveyor General. Once the town of Kingston was established the Cooke brothers saw the potential of the area and built the first jetty. They were largely responsible for the wool stores which were built in the town. The telegraph line from Adelaide to Mt Gambier had passed through the town in 1858. So although Kingston was the land speculator and founder of the town, Archibald and James Cooke were the real founders of the town. 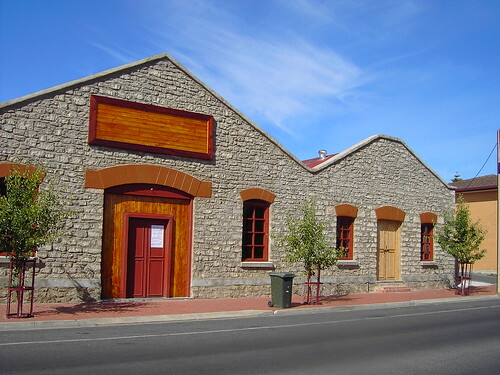 They erected the Kingston Arms Hotel in 1859 to service the needs of the passengers on the new coach service from Meningie to Robe and onwards. Once the pub was operating Cooke then petitioned the government for a police officer in the settlement. Nothing happened until after the government gazetted a government town adjoining the private township of Kingston which it did in 1860 the year before the Hundred of Lacepede was surveyed and declared. The government of course wanted the commercial life of the town to centre near the government services of police, gaol and post office. In 1866 the town got a police station and in 1869-70 a post office and court house. Kingston’s town on the foreshore declined especially after the building of the government jetty in the government town in 1860. The government town got a new hotel, the Royal Mail which accommodated visiting judges, and travellers on the mail run to Port MacDonnell. It was the Cooke brothers who petitioned the government to declare a port at Kingston, and they also petitioned the government for a railway to the Tatiara district around Bordertown. They opposed any suggestion of expanding the port of Robe or building a railway to Robe. The government, who controlled Customs and all official ports, did not declare a port at Kingston until 1865 when they named it Port Caroline. The port was successful immediately as the Cooke brothers were ready to start an international shipping firm by then just as Ormerod did in Robe. When the government later decided to build the first railway in the South East from Kingston and Lacepede Bay to Naracoorte and the Tatiara the future of Kingston was well and truly assured. The narrow gauge railway to Naracoorte opened in 1876 and Kingston became the most important port in the South East. The commencement of the railway provoked a building boom in Kingston in the late 1870s. It also brought two Melbourne shipping companies to Kingston as well who competed with a limited expansion of James Cooke’s shipping firm. By the 1870s Kingston was the main South East port for exporting of wool and grain. Wool was shipped from Kingston direct to England until the end of World War One and after that most wool went direct by road or rail to Melbourne or Geelong, not Adelaide. The port closed in the late 1920s. Meantime in 1865 Mrs James Cooke worked to establish the first Free Presbyterian Church in Kingston. The Congregationalists, the largest denomination in Kingston opened their church in 1868 with an accompanying school that served all children in the town. The institute opened in 1869. There was even an Aborginal school for Aborginal children in the 1870s run by a friend of Mrs James Cooke. By the turn of the 20th century new drainage schemes and closer settlement acts had opened up much of the hinterland to small properties but pastoralism still dominated the district. Deep-sea and lobster fishing became a significant industry in the 1890s and has continued into the present. In the 1880s the Salt Creek Petroleum Oil Company had been formed and had sunk deep shafts searching for oil near the Coorong but this was not successful. Kingston’s continued prosperity relied on pastoralism. •1890s villa house on the corner of the esplanade (jetty built by Cooke in 1863) opposite the Lacepede Motel- the Harbour Master’s House. Like other government buildings it was in the “government town” of Port Caroline. •The old power generator in the park. The towns’ first power supply. •Opposite that is the only remaining of the original three Cooke Brothers wools stores. Note the wide doors used by a spur railway line that went right into the building. Now being used by the adjoining Royal Mail Hotel opened in 1872. •Next look at the original Court House- now a bakery. Built 1869-70. •Kingston Post Office- Georgian symmetry and arches with classical features and decoration. Note square based, pyramid finials on the roof line balustrade. Built in 1867, after Port Caroline declared in 1865. •In the side street from the Post Office go and look at the original Police Station, lockup, and for a time, the first Court House. It is now an antique shop. Built 1864 in the Georgian style with arched windows. •Diagonally opposite the Post Office is the old Bank of Adelaide, now a private residence since 1970. •On the next corner is the modern Council Chambers. If you turn up this street to the left you will see the original Council Chambers (1870s). Almost next door to it is the War Memorial Gardens. The railway line used to pass through this area. •Opposite the War memorial Gardens you can see the original Station Master’s House. The station, now demolished was next door to it. Now return to the Main Street- Hanson Street. You can see some old cottages etc also in the main street.